The fact that people consider scrapple lowbrow diner fare only makes it more surprising that foodies haven't completely gentrified it yet. For the record, I liked scrapple before I even knew what cool meant, and it wasn't until I left the Mennonite bubble that I realized other people associate it with truck stops and spam. 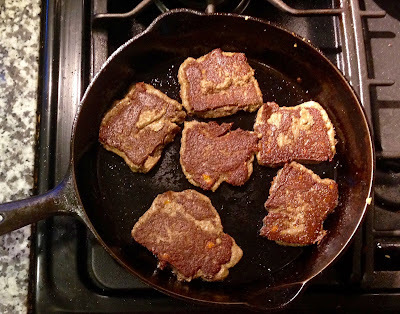 I remain unabashedly fond of it, and anyway, scrapple is a grand old Pennsylvania Dutch tradition and a perfect example of frugal whole-animal butchery. Here's how it works: you make a stock from meaty pork bones and organs, grind the meat and add it back to the stock, and thicken it with cornmeal and buckwheat flour into a polenta-like porridge. You chill the porridge until thick, then slice it and fry it until crisp and deep brown on both sides. Eat it for breakfast with apple butter. Seriously, it's spiced bone-broth organ-meat polenta. It's whole-grain gluten-free brunch. It's all set to be somebody's gold mine one of these days, but I'd rather make it right now for myself. And I'm not going to say this recipe is perfect, because who knows, but holy moly, it sure checks all my boxes. It took me a while to get here. I tried some dead-end recipes, and when I found a promising one I still did a fair bit of tweaking to get it exactly how I like it: smooth, spicy, meaty. 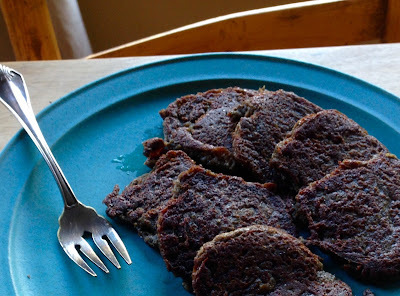 Historian of Pennsylvania Dutch cooking (and distant cousin of mine) William Woys Weaver has in fact written the book on scrapple, and I have adapted one of his excellent recipes here. One difficulty in my scrapple endeavors was getting the meat fine enough with home equipment. Most meat grinders are crap or $$$. In the end, I simply pureed the whole pot of meat and stock with an immersion blender. Super easy, and authentic insofar as it's extremely pragmatic. Liver is crucial for getting the right velvety texture and depth of flavor, but if you have trouble locating pork liver, you can substitute another mild liver, like chicken or calf (but not full-grown beef, much too barnyardy). If you have three quarts of pork stock already on hand--like after boiling a Christmas ham--by all means use it, but don't add any salt till you taste the finished porridge, and add a pound or two of extra meat to compensate for the meat you would have picked from the stock bones. It freezes well, so you might as well make a full batch. Makes about 10 pounds, something like 50-70 slices. Cook gently until the meat is falling off the bone, 3 or more hours. Strain through a sieve, return the stock to the pot, and let the bones cool. 2-3 pounds pork meat, cut into pieces, including at least 1 pound of pork liver. The rest of the meat can be heart, kidneys, or any cheap cut of pork (even ground pork), though if it's a tough cut, you should cook it with the bones so it has plenty of time to break down. Also, don't trim the fat, but do make sure there's plenty of lean meat in the mix, or the scrapple will just melt when you try to fry it. Simmer for an hour. While the liver is cooking, pick the meat from the stock bones and add it to the pot. Don't discard any fatty bits, like the rind from the ham hock: put it all in the pot. Puree with an immersion blender. Alternatively, you can remove the chunks of meat and process them to a smooth paste however seems easiest to you. Mashed through a sieve? Minced by hand? Put through a meat grinder 14 times? The mixture will thicken almost immediately. Cook it over very low heat for 30 minutes, stirring every few minutes. Leave the lid on when you're not stirring it. Caution: it will pop boiling porridge on you. If all your meat was fairly lean, like heart and liver, or the ham hock didn't come with the rind, you may want to add half a cup or more of lard. If there isn't enough fat, the scrapple will not brown & crisp properly. Taste the seasonings and adjust as needed--I usually add more salt. The spices will become more defined after chilling and frying, so don't overdo it. Pour the hot scrapple mixture into greased loaf pans, or casserole pans. I find that this recipe fits into one 9 x 13" casserole and one loaf pan. Let cool, then refrigerate overnight. The next day, you may be able to unmold the loaf pans entirely, or you can slice the scrapple in the pan. If using a casserole, cut it into 4 "loaves" and carefully remove them. Wrapped well, you can freeze them, or keep them refrigerated for a week. It's very important to get the scrapple properly brown and crispy. It does best cooked slowly for at least 5 minutes per side. Cut the scrapple into 1/4" slices. Heat a tablespoon of lard in a skillet over medium heat. When it's hot, add the slices and let gently fry until the underside is deep brown. Flip. If the scrapple is fairly lean, you may need to add more lard to the pan or it will not brown evenly. When cooking on the second side, I often press the scrapple to make it thin and even, then flip it again and cook the first side some more. It's ready when the exterior is deep brown and crisp all over. The inside can be varying degrees of creamy, depending on the thickness of the slices and your personal taste. Is that apple butter in the first photo? 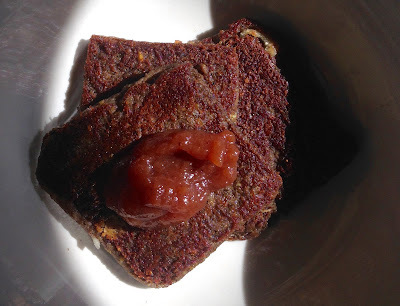 Homemade scrapple has been on my back burner, not literally, unfortunately, for many years. It sounds like the perfect way to cozy up my kitchen during the long winter months, assuming I can get a hold of some tasty woodland pig innards from market. I asked them once about porcine thyroid and they seemed less than certain. Glad to have you back inspiring us all!